Dr. King crosses the Edmund Pettus Bridge with reverends Ralph Abernathy and Fred Shuttlesworth. Rescued from Schapiro’s contact sheets, these are the only known photographs of Dr. King on the bridge. Segregationists answered the protesters’ use of the American flag with the Confederate flag. 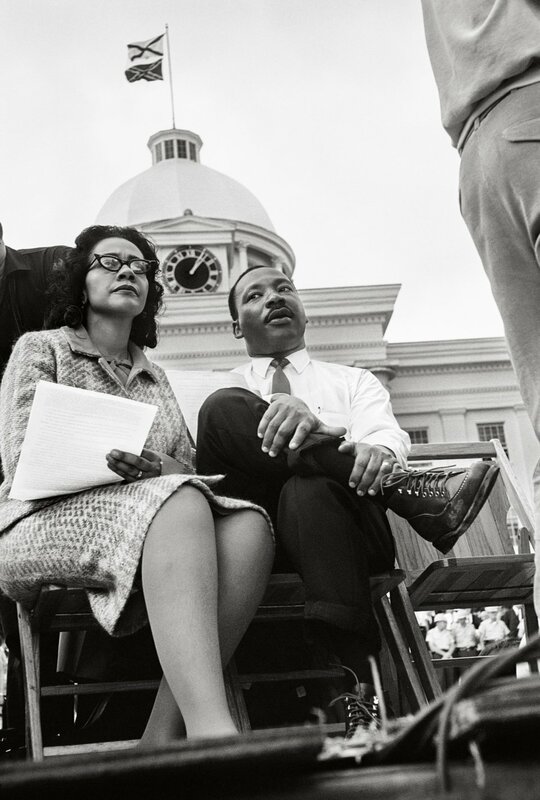 On March 25, 1965, Coretta Scott King and Martin Luther King Jr. sat on stage at the Montgomery capitol building, where King delivered his “How Long, Not Long” speech. In early 1965, Martin Luther King’s Southern Christian Leadership Conference (SCLC) made Selma, Alabama a focus for black voter registration. Over the month of March, hundreds of activists attempted to march the 54-mile (87km) highway from Selma to the state capital of Montgomery to call attention to the segregationist repression and intimidation which continued to disenfranchise blacks, despite the passing of the Civil Rights Act the previous year. The marchers were twice met by vicious state and local violence before they successfully reached Montgomery on March 24, 1965. Distinguished photographer Steve Schapiro was with the marchers on the road. 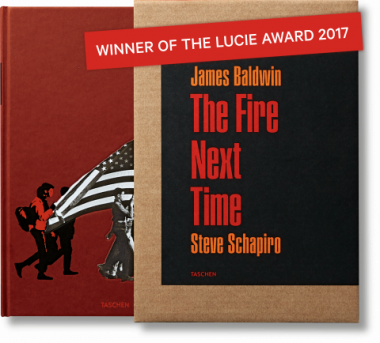 In an excerpt from his essay “Eyewitness” in TASCHEN’s upcoming edition of James Baldwin’s A Fire Next Time, he recalls the cautious mood of the march, febrile with hope as much as fear, and his chilling experience in Memphis three years later, when the death threats against King became reality. The first time I photographed Dr. Martin Luther King Jr., I was not aware that he was going to be one of the most important people of our time. It was impossible to know that then. It was just the start of something. I was lucky to be there to witness this moment of social and political development in our country; I couldn’t think of it at the time because there’s no way you can sense all of that in the moment. You are living it. All the film I shot during the day would go on American Airlines baggage to New York to the Life lab. They would process it. Someone would make little circular clips in the sprockets of the film if they felt the picture was worth printing and that was about it. I was just hoping the pictures I shot that day would appear in next week’s issue, not thinking about where they would be in 50 years. I showed up in Selma close to the time when the actual march happened. It was nearly two years after the March on Washington that Dr. King and the Southern Christian Leadership Conference successfully crossed the Edmund Pettus Bridge—the third and final attempt for protestors to walk the 54-mile highway from Selma, Alabama, to the capital of Montgomery in support of voting rights. The first two march attempts ended with state troopers battering the peaceful demonstrators with tear gas and clubs—the first, led by John Lewis, is known now as “Bloody Sunday” for the violent beatings the protesters endured. The third attempt, led by Dr. King, wasn’t a heavily attended historical event like the March on Washington. There were only 300 people, who had to be protected by federal troops to march. But they did it—and four days later on March 25, 1965, thousands of people greeted them in Montgomery. National and international media covered the event, and the march garnered more support than any prior civil rights effort, leading directly to the passage of the Voting Rights Act. 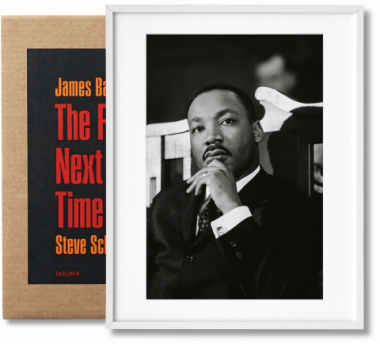 As I was preparing for this book, I went back through my contact sheets from Selma, and was surprised to find I’d taken so many more pictures of Dr. King than I remembered. In many of the photographs, he seems to be looking into the crowd with concern, as if the many death threats he received daily might have credence at any moment. These images of Dr. King have somberness despite the success of the Selma march, because we know that those death threats came true three years later. When he was assassinated, I received an assignment from Life to fly immediately to Memphis. When I got there, I first went to the rooming house where the shots had been fired. The assailant had apparently stood in the second-floor bathroom and leveled his gun on the windowsill. I saw his black handprint on the wall. I photographed everything, I photographed the handprint, and Life ran the photograph as a full page the next week. Then I went to the Lorraine Motel and Josiah Williams, who was one of King’s aides, let me into King’s room. I saw the attaché case on the ledge, the rumpled shirts, and some Styrofoam coffee cups. 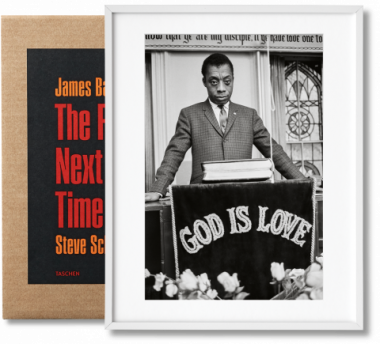 Then Dr. King’s image suddenly appeared on the television set high on the wall. It struck me as a very symbolic moment. The physical man was gone forever. His material things remained. And it felt like his spirit still hovered above us. That was one of the rare moments when I felt I was taking an important picture. I composed a shot with all those elements—the physical artifacts of the room. But Life never even clipped it on the contact sheet. Like I said earlier, you never know the importance of a photo at the moment you are taking it. Though Life didn’t think so at the time, I can’t look at that photograph today without a chill. A great man had just left, and I wanted to try to capture the loss. Impossible, of course. 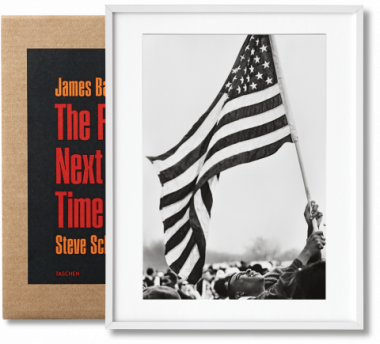 Steve Schapiro’s photographs of the Selma to Montgomery March, Dr. Martin Luther King, and other major civil rights events and activists will accompany TASCHEN’s upcoming letterpress edition of James Baldwin’s A Fire Next Time, one of the most passionate and influential explorations of American race relations. 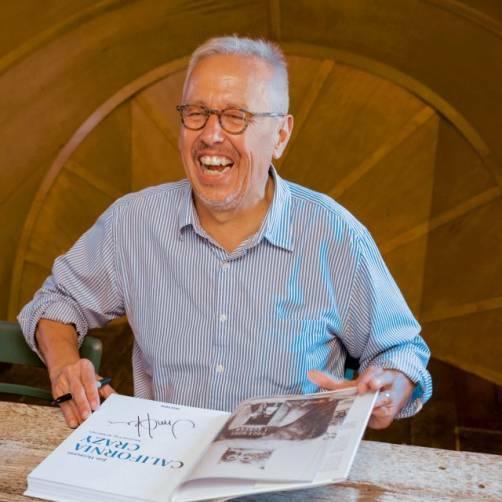 For more information please contact collectors@taschen.com. Thousands crossed the bridge with King, but not all walked the fifty-four eventful miles to Montgomery. 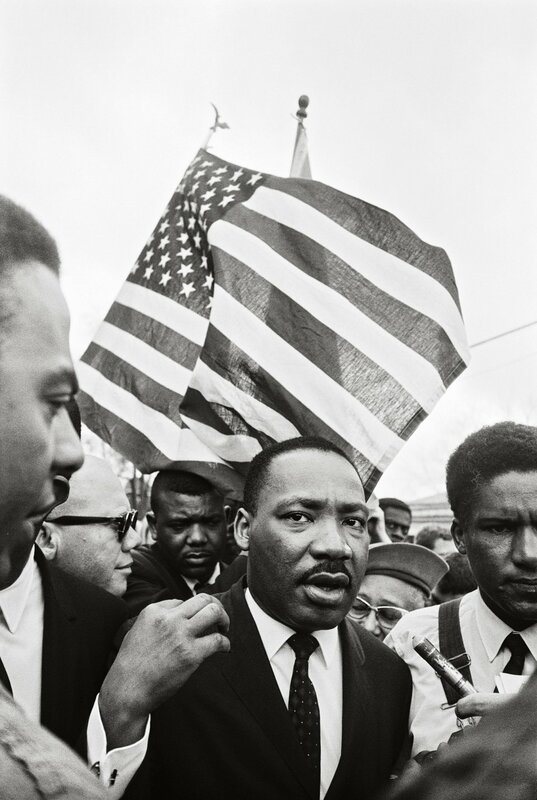 The voting rights fight culminated in the 1965 march from Selma to Montgomery. It would take three attempts. On March 7, Bloody Sunday, John Lewis and 600 marchers were viciously attacked by state troopers. 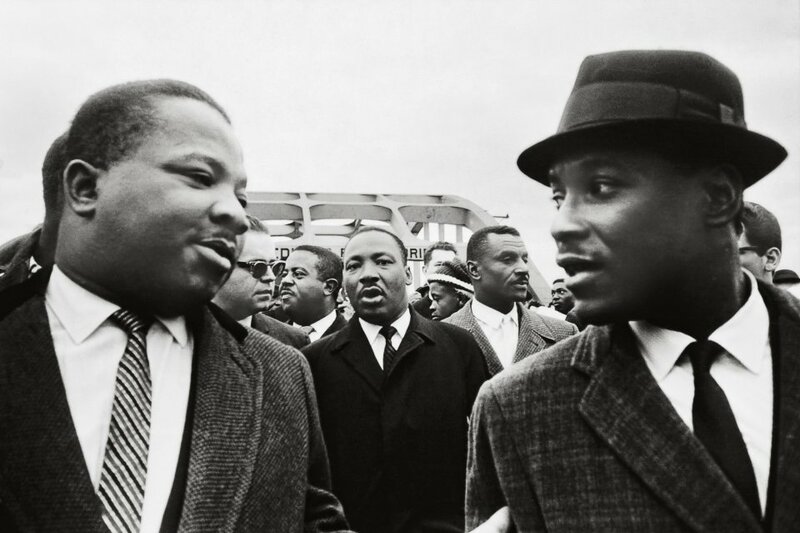 On March 9, Dr. King tried to cross unsuccessfully. Finally, on March 21, under federal protection, the journey began outside Selma’s Brown Chapel AME Church. A court order allowed only 300 people to march when Highway 80 became two lanes. Andrew Young, Ralph Abernathy, Dr. King, and John Lewis lead the charge. President Lyndon B. Johnson provided security for the five-day march. There were 2,000 army troops, 1,000 military police, and a federalized Alabama National Guard.